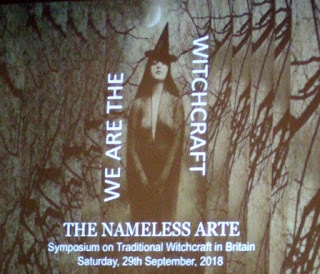 The Nameless Arte has become one of my favourite annual conference on witchcraft and magic. It primarily focuses on traditional witchcraft and folk magic practises from the British Isles, which is one of my own main areas of interest, but also looks at the origins of magic from around the world. 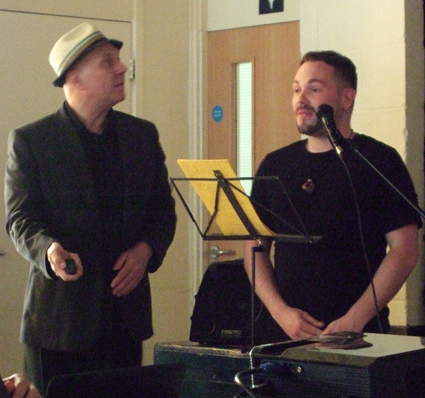 This year's event took place yesterday in its usual venue of a community centre in Westcliff-on-Sea on the Essex coast. 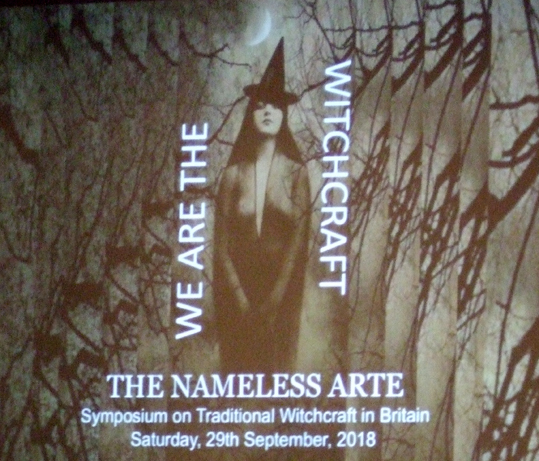 It seems right that a conference on traditional witchcraft should take place in a community centre, because the folk magic of bygone times was community magic. It involved the folklore and beliefs of ordinary people rather than ceremonial magic done by the wealthy or members of the intellectual elite. Nevertheless, one of the talks yesterday was about ceremonial magic - Andy Mercer, occult researcher and author of The Wicked Shall Decay, spoke about John Dee and the origins of the Enochian system. It was a fascinating talk in which Andy gave a down-to-earth and practical view of Dee and Kelly's system, its origins and where to find out more if you want to give it a go yourself. One of the things I really like about The Nameless Arte is that the talks are all by practitioners for practitioners. The speakers rightly assume that the delegates have a good deal of experience behind them already. You don't get talked down to. My favourite talks were on the core subjects of traditional witchcraft, by folk magic practitioners. George Hares (Mr Shadowboy) spoke on British Folk Magic - A Living Tradition and Ash William Mills looked at the history of Scotland’s Cunning Folk, Charmers and Magical Traditions. I took notes during their lectures and I'll be blogging in more depth about them over the next week or so. On non-British subjects, occultist Richard Ward talked about the Origins of Sorcery in Haitian Vodou and Egyptian magic specialist Mogg Morgan gave a lecture titled Egypt's gift - Heka, Magick and Witchcraft. Mogg related the importance of the power of eyes in Ancient Egypt and in European folklore concerning the evil eye and the power of harm in a malicious gaze. Andrew Collins, who lives locally and is well known as author of numerous books including The Black Alchemist and From the Ashes of Angels, was the MC for the day - as he was the previous years. He also talked about the Shamanism of Siberia and Legacy of the Denisovans, which started with an exploration of why doing or saying things nine times is a common tradition in the folk magic of England and Scotland, then went on to look at possible origins in ancient Siberian shamanism. 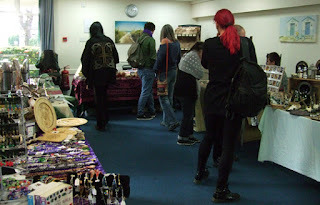 It isn't just the talks that make The Nameless Arte so enjoyable - it is a lovely, small, friendly conference with a great market of stalls. I bought a new cauldron when I was there, which I will also be posting a photo of on my blog later. Refreshments are available throughout the day, including vegan wraps, delicious cakes and unlimited cheap refills of coffee. There's also a pleasant garden outside where you can sit and chat during the lunch break. I also ought to mention that Westcliff-on-Sea's high street is close by and has numerous superb charity shops. One of my friends at the event bought herself a lovely handbag in one of them - it was embellished with a chain of metal charms and I was quite envious of her find. You can view Andrew Collins' page on Amazon and also view The Wicked Shall Decay on Amazon. The photos show one of the slides from The Nameless Arte, Ash William Mills and Andrew Collins testing out the slide projector and the marketplace.